The iSMP4 companion is an enterprise-class mPOS designed to handle the most demanding payment settings. The lightweight device provides the largest screen and battery capacity in its class, allowing merchants and customers to focus on the shopping and transaction experience, regardless of location. Specifically engineered for enterprise merchants’ needs, the iSMP4 accepts all forms of payments including EMV chip & PIN and chip & sign, magstripe and NFC/contactless. Combined with a suite of accessories, including docking station options and a universal tablet enclosure, the iSMP4 is a seamlessly integrated solution designed to meet the needs of a wide variety use cases and merchant types. Booth 1742. Retailers visiting BIXOLON at the NRF Show will get an exclusive look at BIXOLON’s latest mPOS solutions. BIXOLON’s first cube 3-inch thermal desktop printer, the SRP-Q300, is designed to free up counter space and support a range of accessories, transforming it into a complete mPOS solution. BIXOLON’s B-gate Box is a standalone intelligent hub that seamlessly connects the host tablet device, while powering up to 4 USB peripherals, giving retailers the flexibility and scalability to design their own POS environment. The SPP-R410 is 25% lighter and 22% smaller than its predecessor, making this tiny workhorse perfectly suited for retail, warehouse and on-the-go printing applications. Booth 1443. Elo, a global provider of touchscreen computing solutions, announced the availability of a new commercial-grade mPOS system, combining industry-leading peripherals from Star Micronics, Epson, Honeywell, Verifone and Ingenico. The mPOS platform flips between point of sale and self-order kiosk, and integrates best-in-class standard printer, EMV and scanner. It is designed for retail, hospitality, medical and entertainment venues, in addition to any environment with interactive customer transactions. Visit booth #4162 during NRF for a live demonstration of Elo’s touchscreen signage displays and all-in-one POS solutions. The leading in-store shopper marketing optimization platform for consumer packaged goods (CPG) suppliers and retail stores will discuss details of the industry’s first SmartDisplay™ in-store merchandising campaigns at the 2017 NRF Big Show (Booth #4055). For the first time in retail history, a dozen of the country’s largest CPG companies launched Shelfbucks-enabled in-store merchandising display campaigns. The 27 campaigns, created for 21 brands, provided unprecedented insights into POP product displays, including daily performance data and alerts, as well as detailed reports on merchandising supply chain, display arrival and set-up timing, sales floor execution and product sales lift. Zebra Technologies will be demonstrating its new SmartSense for Retail asset visibility solution as well as introducing several new handheld scanners that will help improve the checkout experience for retailers of all sizes. Zebra’s innovations will help retailers execute successful omnichannel fulfillment strategies by bringing the insights of online shopping offline and accelerating the checkout line by offering a faster, more personalized experience. Zebra will also be showcasing how Enterprise Asset Intelligence solutions deliver deeper visibility into retail operations, provide better business insights and enable smarter decisions. Booth 1603. Philips Lighting will showcase its LED-based Indoor Positioning system, visible light communications (VLC), demonstrating how it uses a store’s existing lighting infrastructure to enhance the in store shopping experience. Indoor Positioning allows shoppers and store staff to receive directions to products for better wayfinding or to receive location-based notifications such as in-store promotions. It also allows retailers to engage customers in a more meaningful way, and to use location data analytics to measure marketing impact and optimize store operations, delivering extraordinary value. Booth 240. Cloverleaf, a technology company for the modern brick-and-mortar marketer and merchandiser, launched shelfPoint, the industry’s first digital shelf equipped with emotional artificial intelligence technology. In a non-intrusive and respectful way, without compromising consumers’ privacy, shelfPoint provides a dynamic experience that attracts, engages and converts shoppers. In addition, shelfPoint delivers double-digit sales uplift while providing insights into customer behavior/demographics currently not available to retailers in their physical locations. With most data currently coming at the point of sale, this puts retailers in touch with what’s happening at the point of decision—on the shelf. Booth 723. The high performance Posiflex XT5317 POS terminal has a 17-inch projected capacitive touch screen with a collapsible folding base configurable for maximum viewing flexibility and reduced shipping costs. Projected capacitive touch offers 10-point multi-touch capability, a bezel-free 100% flat, scratch-resistant surface. The XT5317 uses powerful embedded Intel® processors supported by Windows® Embedded operating systems. This combination of Intel and Microsoft assures long-term support and availability, critical for long-term location rollouts. To eliminate additional peripheral power bricks and cable clutter, the XT5300 Series has an optional powered USB upgrade kit. Booth 3071. Oracle Retail Release 16 enables brands to maximize profit and productivity through new cloud services and mobile POS upgrades. Oracle Retail Release 16 accelerates critical decision making through a powerful interface for manager and analysts that is built upon machine learning and data analysts and maximizes user productivity by bridging the gaps between online and traditional point of sale functionality through mobile experiences that inspire store associates to engage consumers away from the register. Oracle now offers over 33 Oracle Retail cloud services, including merchandising and planning solutions, so that brands of all sizes can access best-in-class solutions. Booth 2521. In the “ubiquitous shopping era” –- shopping everywhere, by any means, all the time -–traditional retailers facing new and non-traditional competitors are in fiercely competitive battle for market share. Retailers must transform their businesses from emphasizing transactions to focusing on customer relationships that inspires brand loyalty as customers hop from store to web to mobile to social, and back again. At IBM’s NRF booth this year, we’re showing how AI (Watson) is transforming the entire retail business to make sense of an increasing flood of data, while answering customers’ questions, taking their orders and helping them feel more connected to their brand. Booth 1720. CHERRY, the specialist for computer input devices, has unveiled the MX Board Silent at CES 2017. This new keyboard is based on the G80-3000, which has proven itself over the years to be precise as well as reliable. CHERRY combines this product with its new MX Silent switches to create a product that will keep keyboard noise in a hectic office space to an absolute minimum. The MX Silent-switches have a uniquely shaped rubber pad compared to conventional switches. The integrated 2-component stem reduces audible clicks at the bottom-out and top-out to a minimum. Visit Cherry at booth 413. The Linea Pro 7 is the first enterprise mobility device compatible with the Apple® iPhone 7. 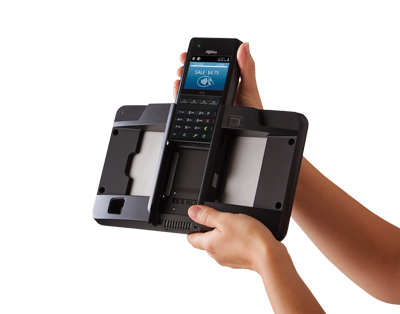 The powerful Linea Pro 7 scanning sled transforms iPhone devices into enterprise-grade barcode scanners and payment devices, making them perfect for warehouse logistics, inventory, ordering systems and retail solutions. It offers a variety of options such as a 1D/2D barcode scanner and a magnetic card reader along with Bluetooth and RFID capability. It is also compatible with the Apple® iPhone 6 and the Apple® iPhone 6s. More than 100 iOS apps are compatible and a full SDK is available for the iOS platform. Booth 1563.